Ever thought about how many zeros there are there in a “pico” something? Remember back in grade school when we learned the metric system of measures? We started out with units that are easy to visualize: meters get 1000 times bigger and become kilometers; meters get 1000 times smaller and become millimeters. We understand these intuitively because we have a frame of reference and can visualize each of those unites of length and distance. Units of mass are the same way; we know a gram is a small unit of mass – we can hold a gram of almost any material in the palm of our hand. For example, a penny weighs 2.5 grams. Stack up 400 pennies and you have a kilogram, or 1000 grams. 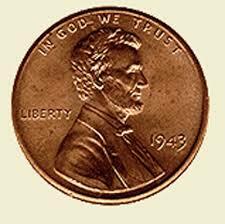 Cut a thin copper shaving off a penny and you have a milligram, or one 1,000th of a gram. Again, these are things we can see, and that makes it easier to understand. As our schooling progressed we learned about very large and very small numbers, exponents, and scientific notation. We put these principles to use in science and learned there are other units of measure larger than a “kilo” and smaller than a “milli”. These are harder to visualize because we have to think in terms we can’t see. For example, the mass of Mount Everest, is 3E18 grams, or 3 “exa-grams” and the mass of the planet earth is 6×10^24 kg, or 6E27 grams (6,000 “yotta-grams”) (see note below). On the opposite end of the scale is the prefix “nano” or 1E-9 of a unit. A nanometer is 1E-9 meters, and a nanosecond is 0.000000001 seconds. I had a hard time visualizing a nano second of time until I learned that it takes about 1 nanosecond for a beam of light to travel one foot. That kind of puts a nano into perspective, doesn’t it? The newest computer chips, for example have transistors with a thickness of 45 nanometers! We can only see things that small with powerful electron microscopes. A “pico” is even smaller than a “nano” , 1000 times smaller! “Pico” means there are 12 places behind the decimal point. Even for a person like me who deals with engineering and science all the time, it can be difficult to visualize a “pico” of something. A pico is so small that even a million picos is still very small amount. It takes a million, million pico grams to make one gram. If you have a million pico-curies in a liter of water, it would take one million liters to provide a total of one curie. To give you a sense of scale, an Olympic sized swimming pool (about 2.5 million liters) filled with water containing one million pico-curies of tritium per liter would hold a total of about 0.3 milligrams of tritium. Said another way; if I had an olympic swimming pool full of pure water and I sprinkled in 0.0003 grams of tritium (less than the mass of one drop of water), then mixed it up, I would have a mixture containing 1,000,000 picocuries of tritium per liter. It is very hard to measure anything as small as a nano or pico of anything. There’s one area where we can: with advances in science, we’ve gained the ability to measure radioactivity in very, very small amounts down to the energy released by single energy particles or beams. This gives us the ability to quantify radioactive material in extremely small quantities. Anti-nuclear activists around the country aided by an uninformed media have grabbed on to the issue of tritium leaks at some nuclear plants around the USA, and are using the issue very effectively to create fear and distrust. Nervous politicians are retreating from positions of outward support for nuclear plants even though the federal government, state agencies, and independent scientists all agree that the leaks pose no threat to public health and safety. The leaks have produced concentrations in special monitoring wells (not drinking water wells) in the range from few hundred to a million or so pico-curies per liter. As I’ve shown, a million pico-curies per liter may sound like a lot, but in reality it is a tiny, tiny amount. Every form of energy production has some impact on the environment. Even wind and solar energy which are viewed by many as environmentally benign, have measurable effects. The production of solar panels results in highly toxic chemicals, and worn out panels could leach chemicals into water supplies. Wind turbines cause noise pollution, kill bats and migratory birds, and catastrophic blade failures can throw lethal fragments hundreds or even thousands of feet. Coal plants dump toxins into the land, water, and air, and the radioactive releases from coal plants are hundreds of times higher than allowed by nuclear plants. Gas power plants emit greenhouse gases and, as we’ve seen in the last week, can and do explode and kill people. Gas pipeline accidents kill people in the USA every year. When nuclear plants shut down all the other plants in that market make money – lots of money. Don’t think for a moment that fact is lost on people who are in the business of selling electricity from natural gas. The increase in gas demand causes gas prices to rise and that hurts everyone else, except but gas distributors, of course. I’m also sure this cash bonanza is not lost on politicians who are recipients of donations from coal, oil and gas companies. It’s time for lawmakers, public service boards, and elected officials to do a reality check. In the case of tritium in groundwater we’re talking about microscopic amounts of material with ZERO safety impact, and ZERO environmental risk. Any time a nuclear plant is shut down, forced to reduce power, or delayed in starting up the replacement power has to come from another form of energy, usually natural gas. When gas demand rises the price goes up and we get higher electricity bills, huge increases air pollution, and further reliance on a volatile, dangerous energy source. 2/16/2010 Note: Thank you to a listener who recognized errors in my discussion of the mass of Mt Everest and planet Earth – my numbers were way too low! After double checking my math, and performing the Earth mass calculation from scratch (there were errors in my source data) I revised these show notes with the correct values. I’ll update the audio podcast as soon as I am able.